Pain on the top of the shoulder is very common in many weight lifters and bodybuilders. 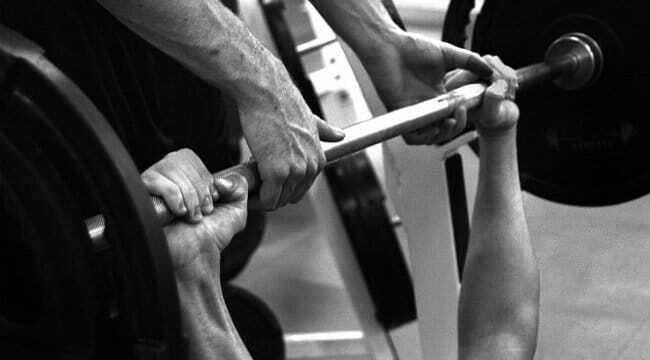 Bench press and military presses tend to be the most bothersome exercises for the clavicle and AC Joint. You stop working out the pain improves. You start back up and the pain returns. Distal clavicle osteolysis in the most common cause of pain on the top of the shoulder in weight lifters. 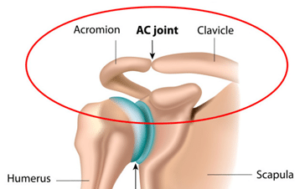 The AC Joint is formed where the clavicle or collarbone contacts or forms a joint with the acromion. The AC Joint is a very small joint, and in weight lifters a ton of stress goes through the AC joint each time you work out. Many people have small bumps on top of their shoulder. That is usually due to bone spurs around the AC joint. Because the surface area of the AC Joint is so small it is easy for the AC joint to become painful over time due to certain sports and certainly due to weight lifting and body building. Osteolysis literally means dissolving (or erosion) of the bone. Because the AC Joint is so small, in certain overuse situations the end of the clavicle deteriorates and starts to breakdown. It is easier sometimes to think of it as a chronic stress fracture of the end of the clavicle. In weightlifters the breakdown of the end of the clavicle occurs faster than the body can repair it. On x ray we will see little cysts in your clavicle in the early stages of clavicle osteolysis. As the process progresses we will see the AC Joint become wider because the distal clavicle (end of the clavicle) is dissolving. The diagnosis of distal clavicle osteolysis is usually made by listening to your story and then finding tenderness or pain when we touch your AC Joint. The pain is frequently isolated to your AC Joint. Tests for the rotator cuff or ligaments around the shoulder are often normal. An x ray will show that the AC Joint is starting to break down. We might see cysts or little fluid pockets in the bone. We might see erosion of the end of the clavicle. 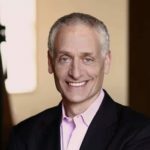 Is Osteolysis of the Clavicle Dangerous? No, osteolysis of the distal clavicle is not dangerous. If you stop weight lifting or the painful activity the pain will usually subside. Just because you are having pain does not mean that you are causing yourself further harm. As long as your shoulder pain isn’t too severe it is ok to workout when you have osteolysis of the distal clavicle. 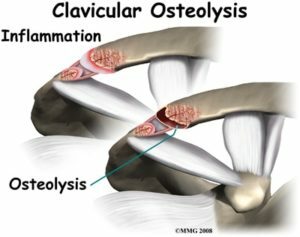 The treatment of osteolysis of the distal clavicle is challenging because this tends to occur in very active people. If you stop the activity the pain will usually subside. But most people with a weightlifter’s shoulder do not want to stop working out…. and I can’t blame you! If your shoulder pain is interfering with your ability to remain active then we might try an injection to calm down the AC Joint. An injection might improve the pain for a few weeks to a few months. On rare occasion the pain relief will last even longer. Many very active people end up choosing to have a shoulder arthroscopy to treat osteolysis of the distal clavicle. They choose to have surgery because they want to remain active and the pain is preventing them from doing so. During the arthroscopy we put a camera into the shoulder just beneath the AC joint. We are then able to see the end of the clavicle. Once the camera is in place we will place another device into the AC Joint to remove the inflamed soft tissue around the AC Joint. We will not take away the ligaments which hold the AC Joint together. After we remove the inflamed soft tissue we perform a “distal clavicle resection”— or removal of a small portion (8-10mm) of the end of the clavicle. This widens the AC joint so the bones of the joint no longer touch one another. This also removes the portion of the clavicle that was inflamed and disintegrating. The recovery time from distal clavicle surgery is usually fairly quick. Many active weight lifters will be back in the gym within a few weeks. Some sooner and some later. As long as no other problems were found that needed to be repaired we allow you to start moving your shoulder as soon as you are comfortable. The success rate of surgery for distal clavicle osteolysis is between 80-90%. We would expect it to be higher, but it is not. Why some people continue to have pain is confusing. Perhaps it is because something else is bothering the shoulder… but often that is not the case. A more scientific and in depth discussion. It is nice to see a doctor that believes that patients should be informed about their medical conditions. As a person who has extensive medical knowledge but is not a doctor I can say that it is nice to discuss any medical issues with them in an intelligent manner. You cannot make an educated decision about your own body without having all the facts. Thank you!